If you are lucky enough to be going to New York this summer, make sure you leave time to check out its newest park – the High Line. The High Line, which opens later this Spring, has supporters ranging from U.S secretary of state Hillary Clinton to actor Edward Norton. The difference between The High Line and a traditional park is that you won’t find it at ground level. 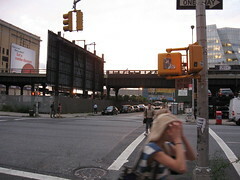 It has been cultivated on a disused elevated railroad above the streets of Manhattan. You can read more about the story behind the High Line’s creation in an article I have written for the March edition of New Start.